An al-Aqsa Martyrs Brigades leader says the Palestinian militant group will no longer respect a six-month truce after Israeli raids killed three militants. "There will be no limits to our responses... We need to protect our people," said Zakaria Zubeidi. Mr Zubeidi speaks for the group only in Jenin, where one of its commanders was killed during an overnight raid. 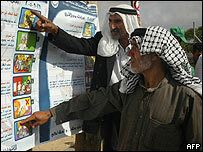 Meanwhile Palestinians in the West Bank are voting in local polls - the first since Israel's pullout from Gaza. Samer Saadi, a local leader of the al-Aqsa Martyrs' Brigades, was shot dead during what Israeli forces called an arrest raid in Jenin. The other two men, both members of the Islamic Jihad, were killed in an exchange of fire in the nearby town of Birqin. "This Zionist enemy only understands the language of bullets. We in the al-Aqsa Brigades have committed ourselves to the truce but this enemy is not committing to the truce," Mr Zubeidi told reporters. 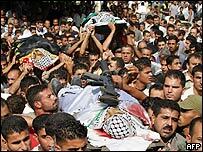 The deaths come in an upsurge of violence since Israel completed its withdrawal from the Gaza Strip on 12 September. According to the Israeli army, Saadi was killed as he fired at soldiers, while the two other men killed in a separate incident had assault rifles and were about to do the same. Israel has made more than 400 arrests in the West Bank since militants launched rocket attacks at the end of last week. Thursday's vote is seen as a test for the militant group Hamas, which has been feted by Palestinians for driving Israeli forces from Gaza, but which has also been blamed for the latest round of violence. Election monitors said the turnout was high in the vote that will decide more than 1,000 council seats. Israel Radio reported that the army had allowed Palestinian police to carry weapons during the vote and international observers to monitor it. Israeli Prime Minister Ariel Sharon has rejected suggestions that Israel could stage take more unilateral steps after the Gaza pullout. "There is only one plan and that is the roadmap," he told a Tel Aviv business conference, referring to the internationally-backed peace plan which has lain largely dormant since its inception in 2003. Key Sharon aides have been suggesting that Israel could pull back from parts of the West Bank and unilaterally set its border if negotiations with the Palestinians failed. Gaza plan architect Eival Giladi, Sharon adviser Eyal Arad and cabinet minister Tzahi Hanegbi have all spoken in such terms this week. "Numerous ambassadors telephoned my office to obtain an explanation," Mr Sharon said. "We have made a big effort to calm things down and reaffirm that the road map is the only plan that has our support," he said. Israel occupied the Gaza Strip and West Bank, including east Jerusalem, during the 1967 Arab-Israeli war.